We need to pay more attention to our impact as humans. We must constantly think of what legacy we will leave, how we'll give back to our communities and even more so, what can we do that will have a profound effect on the world. 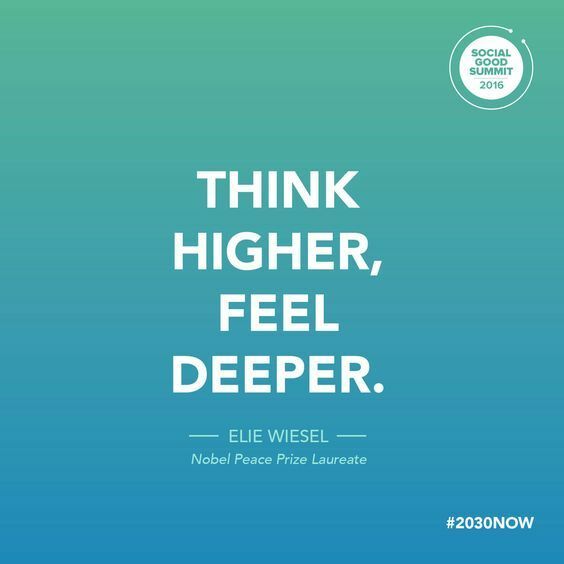 It's these very thoughts that drive the inspiring and innovative leaders, speakers and attendees that gather at the Social Good Summit every year in New York. Realizing this need and the importance of including all voices in conversations pertaining to bettering the world, ColorComm, an organization of women of color in the communications field, partnered with the UN Foundation to bring 4 of their members to the Summit for an amazing VIP experience. This charge led by ColorComm member and UN Foundation employee Claire Ross, was one of insight and passion. With the knowledge that a diverse voices help create change and thus impact outcomes, she was able to expose a group of unique women to events, in depth conversations and Master Classes with leaders and entrepreneurs. Below are the top 5 takeaways from an amazing two days in a city buzzing with excitement and filled with leaders from around the world. On social media: "Dialogue not diatribe. "- Laura Walker, CEO & President of New York Public Radio. Be deliberate about what you share on social. Add to the conversations in a positive way and choose your content wisely. "The US is more actively engaged in things happening around world than it has been ever before. "- Secretary of State, John Kerry. Even though. It may seem like the world is in a crazy place, but we're working and we can keep getting better. It truly matters that you give back and speak up. "Change is difficult, but not impossible"-Representative from the Malala Fund. There were a lot of issues discussed at the Summit that seemed insurmountable, but what was inspiring was that, regardless of how tough it may seem, there are many many people trying to create change. "Black women in NYC are more likely to die from childbirth issues than women in Vietnam and North Korea" -Anita Sharma, UN Foundation. Childbirth issues are not just for other countries or third-world countries, they're happening here too and we need to fix it everywhere. "There are 65 million refugees, if it they were a country or a market, it'd be the 11th largest in the world." -James Irungu Mwangi, Dalberg, Johannesburg, South Africa. This number is staggering, shocking and most of all scary. We create a narrative that refugees are violent or will ruin the economy, when the truth is that they are fleeing violence and will help impact communities positively, if given the chance. Last week in New York at 92Y, there was a convening of positive energy that can change the world. There was a meeting of minds that put their time, sweat and energy into trying to change the lives of women, refugees and others suffering from the lack of equality in the world. There was a gathering of positivity and compassion. There was learning. There was better understanding and hopefully all of this will impact our world.